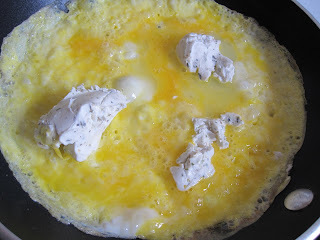 I raved a while back about the goat cheese omelets at a French bistro in my neighborhood. 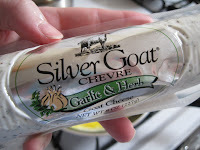 They are so good that I was determined to make some at home. How hard can that be, right? It's really not hard at all. 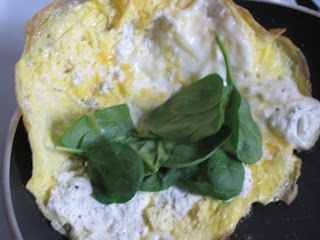 I'd just folded over the eggs onto the goat cheese when I remembered I'd forgotten the baby spinach (also from Trader Joe's, 1.99 for a whole bag, which lasts about a week!) 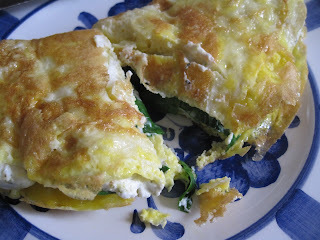 I hastily flipped open the omelet and threw a handful of spinach leaves down. Better late than never, right? 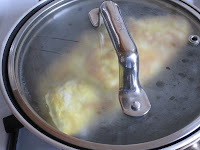 When the eggs had almost set, I turned off the heat and put the lid on the pan (a trick my mother taught me---and she thinks I never listen ;) for a few minutes. 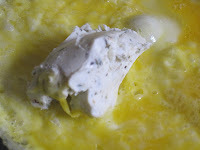 This kept the heat and moisture in and makes the eggs extra fluffy. 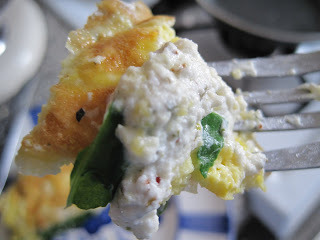 This omelet was everything I hoped it would be--fluffy, tangy, and affordable enough to qualify for a Recession Recipe! Try it at home--it will really spike your breakfast in the most delicious way.